Every year, the AICPA considers changes to the CPA exam based on new laws or changes to the Authoritative Literature. These changes are meant to reflect what’s happening in the business environment, and keep exam candidates up-to-date and aware of new topics as they go into the work force. Earlier this year, the AICPA announced sweeping changes to the CPA exam due to the Tax Cuts and Jobs Act passed by Congress in December 2017. These changes won’t go into effect until 2019, giving you time to pass REG before they’re implemented into the exam. The Tax Cuts and Jobs Act represents the biggest update to the U.S. Tax Code in over 30 years. The point of the bill is to boost the economy through a variety of factors, including decreasing taxes for both individuals and businesses, which increases take-home pay thereby stimulating economic growth. The bill lowered corporate and income tax rates. The standard deduction was doubled. The child tax credit was expanded. The individual healthcare mandate was repealed. No matter which field of accounting you’re headed in to, the new tax law is going to impact your work. However, by sitting for the exam now, you can avoid being tested on the major changes. The Regulation Exam (REG) is 60-80% taxes, which means it’s the exam that will undergo the most change from the new Act. Considering the Tax Cuts and Jobs Acts lowers both corporate and income tax rates and makes sweeping changes to deductions and credits, and REG has a heavy emphasis on the taxation of individuals and entities, we know there are going to be major updates to the exam. Outside of the tax-specific portion, the remaining REG topics include federal tax procedures, which will likely include updates related to the Act. The bottom line is that we know REG is going to undergo major changes simply because the content in tax-centric. But when will these changes take place? According to the AICPA, the new tax law will not be integrated into the exam until the January/February 2019 testing window. If you purchased testing materials earlier this year, they likely have pre-Tax Cuts and Jobs Act materials. If you’re purchasing testing materials before the end of the year, you need to make sure you know when you’re taking REG. By taking it before year end, you can purchase current materials and have the right information to pass. If you finished college in Spring of 2018, you likely learned about the tax law before the Tax Cuts and Jobs Act, since it was implemented in 2018. If you’ve already started studying for REG but weren’t planning on taking it this year, you’ll have to learn all new material. Tax laws are not static, and one of the biggest takeaways from the Tax Cuts and Jobs Act is there is a chance it will get updated in future years. By taking REG now, you skip the hassle of having to deal with those changes should lawmakers update the Act. 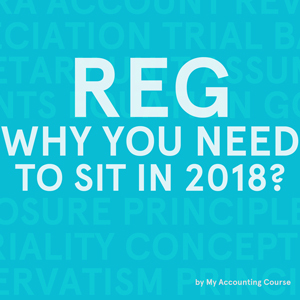 By sitting for the exam now, you don’t have to relearn tax laws or worry about having the most up-to-date exam prep materials (although, good CPA exam prep companies will send you updated materials for free). We know the exam is stressful, and by taking REG before the updates, you can take a little bit of the pressure off. When it all boils down, you’re going to have to learn about the Tax Cuts and Jobs Act. You’re an accounting professionals, and the new laws are going to affect your work whether you’re in public accounting, industry or government. However, by taking the exam before 2019, you can avoid being tested on the major changes and instead learn about them as you delve into your new career. Liz Kolar has been teaching CPA Review for more than 30 years in the United States, has personally taught more than 2,500 live sessions, and has helped thousands of candidates pass the CPA Exam. She founded Pinnacle CPA Review and co-founded Surgent Kolar CPA Review.